Report from Matius MuribAt around 7.30pm, on Thursday 6 July, a group of four policemen from the elite force Brimob, Papua District, stopped the car in which the chairman of the Baptist Synod, Socrates Sofian Yoman was travelling, together with his wife and their three children, along with Matius Murib, the former deputy chairman of Komnas HAM-Papua. They were on their way home after attending prayers at Kota Raja Luar.The car door was forced open by someone, and another member of Brimob shone a torch.in the face of Revd Yoman. Murib later told the media that apparently they had been followed since they were driving past the town library. The police who had been travelling in a truck pointed their torch at Yoman. In response to this unacceptable behaviour, he said: ‘I’m sorry. It wasn’t deliberate.’ But within five minutes, the police started pushing the body of this man who is a well-known church leader, while shouting at him. Matius Murib thought that the police didn’t realise that they were talking to the President of the Synod of the Baptist Church, Revd Socrares Sofian Yoman. At this point, a senior police officer arrived at the scene to caution the police who were terrorising the President of the Synod. They subsequently withdrew and returned to their barracks. Matius said that this incident would be reported to the deputy police chief in Papua. ‘Go ahead and report. We aren’t afraid ‘ the four policemen replied. They then withdrew from the scene and left, going in the direction of the police command office in Abepura. Matius Murib said that he hoped that the chief of police would investigate this case and call to account the four police officers who had behaved so arrogantly towards a well known leader of the Papuan people. 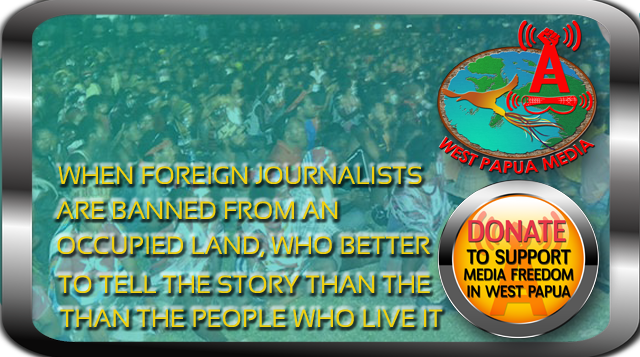 The action they had taken was a deliberate act of provocation intended to arouse the feelings of the Papuan people.